To go to a page devoted to my corrections, clarifications, and second thoughts about Funnybooks, click here. In his compelling new biography, noted animation historian Michael Barrier avoids the well-traveled paths of previous biographers, who have tended to portray a blemish-free Disney or to indulge in lurid speculation. Instead, he takes the full measure of the man in his many aspects. A consummate storyteller, Barrier describes how Disney transformed himself from Midwestern farm boy to scrambling young businessman to pioneering artist and, finally, to entrepreneur on a grand scale. Barrier describes in absorbing detail how Disney synchronized sound with animation in Steamboat Willie; created in Snow White and the Seven Dwarfs sympathetic cartoon characters whose appeal rivaled that of the best live-action performers; grasped television's true potential as an unparalleled promotional device; and—not least—parlayed a backyard railroad into the Disneyland juggernaut. Based on decades of painstaking research in the Disney studio's archives and dozens of public and private archives in the United States and Europe, The Animated Man offers freshly documented and illuminating accounts of Disney's childhood and young adulthood in rural Missouri and Kansas City. 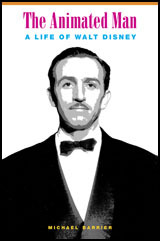 It sheds new light on such crucial episodes in Disney's life as the devastating 1941 strike at his studio, when his ambitions as artist and entrepreneur first came into serious conflict. Beginning in 1969, two and a half years after Disney's death, Barrier recorded long interviews with more than 150 people who worked alongside Disney, some as early as 1922. Now almost all deceased, only a few were ever interviewed for other books. Barrier juxtaposes Disney's own recollections against the memories of those other players to great effect. What emerges is a portrait of Walt Disney as a flawed but fascinating artist, one whose imaginative leaps allowed him to vault ahead of the competition and produce work that even today commands the attention of audiences worldwide. To go to a page devoted to my corrections, clarifications, and second thoughts about The Animated Man, click here. Hollywood Cartoons: American Animation in Its Golden Age (Oxford University Press, 2003; trade paperback, 648 pages; $19.95). My critical history of American theatrical animationpublished in hardcover in 1999 and reissued as a trade paperback in October 2003 covers the fifty-five-year period from Winsor McCay's first film in 1911 through the death of Walt Disney in 1966, with an afterword on recent developments. 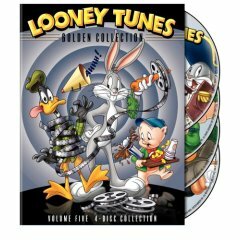 Hollywood Cartoons: American Animation in Its Golden Age is the first full-length portrait of a beloved but poorly understood American art form, the animated cartoon of the thirties, forties, and fifties. The book explains how artistic decisions, personal dynamics, and outside forces shaped the seven-minute comic masterpieces that emerged from such cartoon studios as Disney, Warner Bros., and MGM. It also explores in depth the production history of the landmark animated features, including Snow White and the Seven Dwarfs, Pinocchio, Fantasia, and Dumbo. The book captures the giants of American animationWalt Disney, of course, and directors and animators like Tex Avery, Bob Clampett, John Hubley, Chuck Jones, Rod Scribner, and Bill Tytlain the act of creation. It places their work in the context of developments in the movie industry, but it also shows how the animated cartoon's history was influenced by broader currents of thought. Strongly held ideas about acting, the fine arts, and even politics suffuse many cartoons, and the book traces such connections. As it makes clear, though, the greatest creators triumphed not by borrowing from other art forms, but by embracing the unique virtues of their medium. Hollywood Cartoons: American Animation in Its Golden Age is based on more than twenty-five years of research. Much of that research involved the scrutiny of sources that have barely been touched by other authors: thousands of rarely seen films; interviews with hundreds of people who worked in the cartoon studios; and obscure documents in dozens of government and corporate archives. It includes fifty black-and-white illustrations and detailed source notes. New York Times Book Review (Terry Teachout): "those who take the art of animation seriously will find this tough-minded book challenging and revelatory." Publishers Weekly: "easily ranking as the definitive overview of the animation industry's accomplishments." The Economist: "His book is rich in nuggets that bring the era ... vividly to life." Boston Book Review: "a magical gift." Here is what John Canemaker said about Hollywood Cartoons: American Animation in Its Golden Age in a blurb for the dust jacket: "Barrier's research is rich and impeccable, his arguments articulate, and his uncompromising, astringent conclusions will be a source of scholarly debate and discussion for years to come." When Kevin Brownlow's magnificent history of silent film, The Parade's Gone By ... was reissued in paperback some years ago, Brownlow included four pages of corrections of minor errors, noting ruefully, "I used to think that for a book of film history to contain a single error was shocking enough to dismiss it out of hand." Alas, Hollywood Cartoons: American Animation in Its Golden Age included a few errors in its hardcover edition, too. A list of those errors, as well as some points that I should have clarified or amplified, is available by clicking here. All of the actual errors on the list have been corrected in the second printing of the paperback edition (as have a number of typos in the hardcover's index). Carl Barks and the Art of the Comic Book (M. Lilien, 1982; $90; hardcover, 228 pages). Carl Barks has always been my favorite comic-book artist/writer, and I began writing about him in the late sixtiesa biographical essay for Comic Art, a multi-installment bibliography for Funnyworld. Those writings grew into this book, which combines a biography with a complete and detailed bibliography. It is extensively illustrated with photos of Barks from throughout his life and excerpts from his stories. Copies of the original hardcover edition are still available from the publisher and through the Barnes & Noble website. Unfortunately, the publisher chose not to incorporate any corrections in a second printing, but I've posted a list of errors, and I'll be adding to it as additional errors come to light. Let me also recommend Carl Barks: Conversations (University Press of Mississippi, paper, 248 pages, $18), edited by Donald Ault. This collection of interviews with Barks includes extensive excerpts from my interviews with him in the seventies. The book has not received the attention it deserves, but you can click here for a detailed review by Kevin McGowin. A Smithsonian Book of Comic-Book Comics (Smithsonian/Abrams, 1982; hardcover; 336 pages; out of print). The late Martin Williams and I co-edited this anthology of classic comic-book stories, reproduced in full color. The first Superman and Batman stories are included, along with some of the best work of Carl Barks, Will Eisner, Harvey Kurtzman, Bernard Krigstein, Sheldon Mayer, John Stanley, Basil Wolverton and others. Although the book is out of print, used copies are readily available at reasonable prices through amazon.com and other online booksellers. From Aargh! To Zap! Harvey Kurtzman's Visual History of Comics (Kitchen Sink, 1991, hardcover, 96 pages; also published in paperback by Prentice Hall; both editions are out of print). This oversized book, which combines text with an abundance of illustrations, was the product of my collaboration with Kurtzman in the early nineties. Harvey had gathered material for such a book over many yearsa number of comic-book artists had filled out questionnaires for himbut he had never been able to knuckle down and write it. When he was fatally ill (he died in 1992) and anxious to complete the book, I was enlisted to help him. We spent an afternoon in March 1990 talking about comics with a tape recorder running, and I combined material from that long interview with bits and pieces from other sourcesarticles by Kurtzman, interviews with him, miscellaneous stuff from his research filesto come up with the text. For those parts of the book for which no source material of any kind existed, I had to imagine what Harvey would have thought about a particular artist or comic book, if he had ever paid any attention to them. (He was very much a dry hole where recent superhero comic books were concerned.) Harvey reviewed everything I wrote, and revised or approved it as he saw fit. The resulting book, "by Harvey Kurtzman with Michael Barrier," is thus in Harvey's voice, but the writing is mostly mine. An interesting book, if not the definitive history that many people hoped that Harvey would write. Volume One: Rabbit Seasoning, Bully for Bugs, Big Top Bunny, Wabbit Twouble, Duck Amuck, Drip-Along Daffy, The Scarlet Pumpernickel, The Wearing of the Grin, Duck Dodgers in the 24 1/2th Century, Fast and Furry-ous, Hair-Raising Hare, Haredevil Hare, For Scent-imental Reasons, Bugs Bunny Gets the Boid, Tweety's S.O.S., and The Foghorn Leghorn. 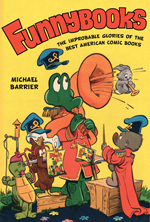 Volume Two: Tortoise Beats Hare, Slick Hare, Beep Beep, The Dover Boys, A Bear for Punishment, Kitty Kornered, Baby Bottleneck, Porky in Wackyland, Book Revue, A Corny Concerto, and One Froggy Evening. Volume Three: Bowery Bugs, Hillbilly Hare, The Coo-Coo Nut Grove, The Odor-able Kitty, and Walky Talky Hawky. Volume Four: Now That Summer Is Gone, Cracked Ice, and Porky's Poultry Plant. Volume Five: A Tale of Two Kitties, Buckaroo Bugs. 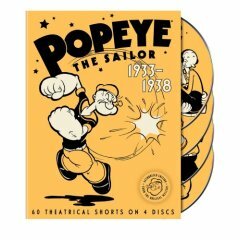 Volume One: Popeye the Sailor, I Eats My Spinach,and King of the Mardi Gras. Volume Two: A Date to Skate, Cops Is Always Right, and It's the Natural Thing to Do. I've made a few errors in my commentaries, which I've listed here.